The ROCA Test helps clinicians identify whether a woman may have ovarian cancer. The ROCA Test is not yet available through the NHS. The UKCTOCS will publish the results of its extended follow-up phase at the end of 2019 to help give a clearer indication of whether screening using the ROCA Test reduces the number of deaths due to ovarian cancer. If a positive result is reported and screening proves to be economically beneficial, Public Health England will consider rolling out a national screening programme for post-menopausal women over 50 years old. The Lancet publication3 compares the stage of ovarian cancers detected in the MMS and Control arms of UKCTOCS and reported a significant stage shift, i.e. more Stage I, II and IIIa ovarian cancers being detected through screening (119 of 299 [40%]) than the no screening group (149 of 573 [26%]; p<0001). Mortality analysis revealed an average reduction in ovarian cancer deaths of 15% in MMS group compared to control but this was not definitive. The final extent of reduction remains to be determined as the ovarian cancer death rates were increasing in the control group and levelling off in the multimodal and ultrasound groups. Follow-up is continuing till 31st Dec 2018 when a second mortality and cost effectiveness analysis will be undertaken. A highly significant reduction in the proportion of women being diagnosed with macroscopic metastatic disease outside the pelvis (from 95% to 37%). A significantly lower proportion of women requiring neoadjuvant chemotherapy (5% vs. 44%). A very high proportion (95%) with zero residual disease post-surgery, despite the lower use of neo-adjuvant chemotherapy. 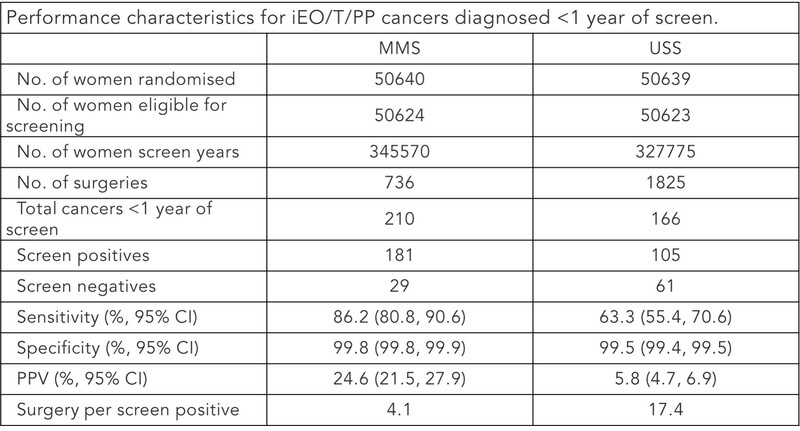 Zero residual disease status is one of the strongest predictors of prognosis in ovarian cancer. Only 21% of women undergoing surgery required anything more than a simple hysterectomy and omentectomy, compared with clinically presenting cases, where surgery is usually more complex and frequently involves other procedures such as bowel resection. 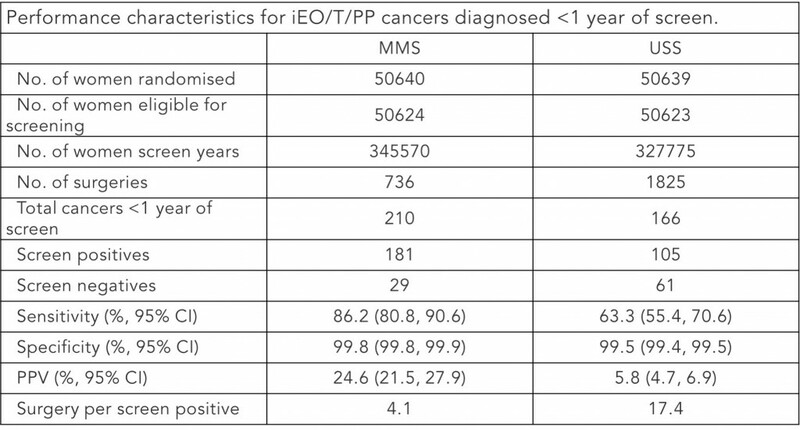 In a parallel US publication6 (including a smaller number of incident cancers), although it included a smaller number of incident cancers, demonstrated similarly encouraging earlier stage diagnosis. Qualitative data7from the UK cohort suggests that screening itself may prompt women to focus on their risk of cancer and push them towards the risk-reducing surgery which they need. Therefore, another important secondary benefit of screening may be that it encourages uptake of a proven cancer prevention strategy. Lifford KJ Clements A, Fraser L, al. A qualitative study of women’s experiences of familial ovarian cancer screening. Psychooncology. 2013; 22:2576-84.